For domestic usage only. Not to be used with waste disposal units. Only one appliance should discharge at a time. Can be used in place of Sanivite macerator. Uses 32mm waste pipe. Can also be used with a shower. 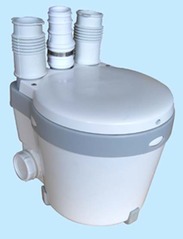 The unit can pump 5m vertically or 50m horizontally or a combination of the two. The dimensions are L = 260mm D = 228mm and H = 220mm.